Rinse frozen Alaska Crab legs under cold running water to remove any ice glaze; pat dry with paper towels. Discard towels. Steam or boil frozen crab in a large pot for 6 to 8 minutes, until heated through. When cool, use kitchen shears to cut the shells open and remove crabmeat. Chop or shred meat, if desired. Over an open flame (grill or cooktop), roast bell peppers until blackened. Cool slightly; rub off skin with a paper towel (or place in a paper bag for 5 minutes for skin to soften). Seed and thinly slice peppers. Mix sour cream, cilantro and lime juice together in a small bowl; set aside. 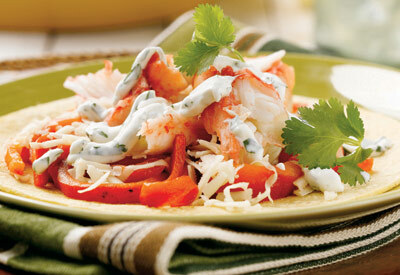 To serve, divide red pepper strips, cheese and crabmeat between tortillas. Top with 2 tablespoons sour cream mixture. Serve with your favorite hot sauce, if desired. Cook's Tip: Alaska Crab is already fully cooked, so thawed crab legs may be shelled without steaming or boiling.